First off: The team is confident that Juan Pablo Angel, who survived that horror tackle by Toronto's De Guzman last week at the Disney Cup with just a lower leg strain, will be able to play in the Red Bulls/Santos friendly on March 20th. To further expand on that, it was reported (by @NewYorkRedBulls on Twitter) that JPA was hitting the treadmill today. Good news all around! Then: it seems that Red Bulls Academy product Juan Agudelo is very keen on staying with the team. It all depends now on the league accepting a counter-offer from his agent. C'mon Mr. Garber, let's get this done! And last from Mr. Lewis: It seems the Red Bulls are trying to sign several players and will be bringing in several more for trials during their second Florida pre-season stint. It also appears that Chris Albright might be further away from coming back than was originally hoped for. The Red Bulls might have to go with a Sassano/Hall right back tandem, unless Enar Jääger is signed. A couple of days ago we reported on Red Bull Arena's turf trouble. It seems that the new sod has been brought in and is being installed as of today. The club announced that season tickets packages will be mailed out starting tomorrow (Friday) via FedEx. Dietmar Beiersdorfer, the Sporting Director for all Red Bulls clubs, has publicly announced that Brazilian Ze Roberto is his prime target this summer for RBNY. 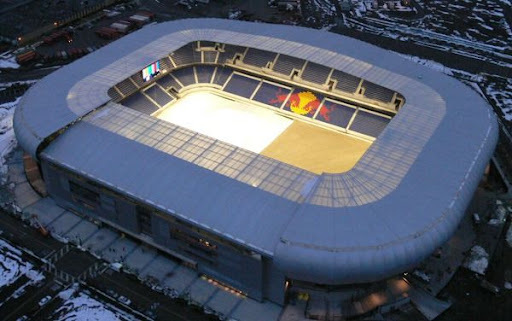 The word I'm hearing, from my massive army of contacts, is that the 2010 UEFA Champions League Final will be shown on the large screens at Red Bull Arena, following the May 22nd Czech Republic/Turkey friendly. Recently waived RBNY Midfielder/Forward Matt Mbuta has returned to Crystal Palace Baltimore of the USSF 2nd Division. Mbuta will go down in history as the last ever goal scorer at Giants Stadium. Good luck Matt! Finally, The Viper's Nest own Matt Conroy (aka Who Shot Sam) will be a guest tomorrow (Friday, March 5th) on the super excellent It's Called Football. He'll be there to discuss the outlook for the 2010 Red Bulls, the new stadium, etc... The show will air live at 2:00pm Eastern Time so be sure to check it out. Edit: We've just received word that the Red Bulls will play a scrimmage against Miami FC in Sunrise, Florida next Friday March 12th. Also, the Red Bulls will play a scrimmage up at West Point against the Army men's soccer team on Monday, March 29th.